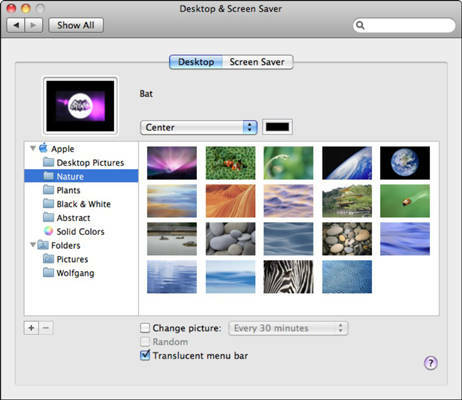 In Mac OS, the System Preferences controls how your Mac runs and behaives, some settings change users specific settings such as Desktop and Finder, while other affect the entire system. If a padlock icon appears in the bottom left of a preference window, then you will need Administrator rights to change those settings. For example, if you wanted to change Desktop and Screen Saver you get the following window with a list of possible settings. General - Set appearance, colour, scroll bars, browser and recent items. Display & Screen Saver - Set the desktop background or colours and screen saver. Dock - Configure size, magnification, position, and animation of dock and icons. Mission Control - configure spaces, groups and keyboard or mouse shortcuts. Language & Region - Set date and time formats, location, welcome screen settings and languages. Security & Privacy - Set Password, app store security. Configure network protection against unauthorised access to your system. File Vault for file system encryption. Spotlight - Sort order in which search results are ordered, keyboard shortcut. Notifications - configure which alerts you want to see and how they are displayed. Displays - Configure item sizes, text sizes, resolution, colour, display settings and ClearType text. Energy Saver - Set computer and display sleep settings, wake up options, brightness level and battery options. Keyboard - Configure repeat delay, repeat rate, backlit, shortcuts, input sources and dictation for keyboard. Mouse - Configure buttons, speed, zoom and other mouse options. Trackpad - Configure tracking, click and scrolling speeds and gestures to use. Printers & Scanners - To manage peripherals such as scanners and printers. Sound - Configure playback and recording devices, sounds effects, balance and volume. iCloud - Specify what items to sync to icloud incl. mail, contacts, calender, notes, documents etc. Internet Accounts - Setup accounts for iCloud, Exchange, Google, Twitter, Facebook etc. Networks - Configure Ethernet, Wireless, Firewire, Blue tooth and network protocols. Bluetooth - Turn bluetooth on and off and list available devices. Sharing - Enable sharing for files, web, login ftp, remote desktop, printers and so on. Users & Groups - Create, modify and delete user accounts, groups and login options. Parental Controls - Enable and restrict access to type or named websites to specific accounts. AppStore - Configure system and app update settings. Dictation & Speech - Setup speech recognition and dictation, including voice, rate, alerts, language. Date & Time - Configure local date and time settings, time zone and clock format. Startup Disk - Specify which disk or partition to boot from. Time Machine - Configure and start backups and restore of user data. Accessibility - Manage ease of use tools and settings including Display, Zoom, Magnifier, On-Screen keyboard, Narrator, High Contrast.